Following her triumphant world title in 2008, Mao Asada was seen as Japan's greatest chance of Olympic gold at Vancouver, although the rise of Asian rival Kim Yu Na has somewhat dampened hopes since then. Mao Asada first strapped on a pair of skates as the age of five, following in the steps of her older sister Mai who also went on to skate at competition level. Her grace provided a natural platform for her talent came to the fore and in 2005 at the age of 15 when she won the Bompard Trophy at Paris, a new star was well on her way. Too young to compete at the 2006 Turin Games (she was born in September 1990), but already adorned with the 2005 junior world championship, she won a world championship silver medal on home soil at Tokyo in 2007. Then came her greatest triumph to date when she skated to the world title in 2008 on Swedish ice at Gothenburg. The Japanese starlet then went on to win the Four Continents championship, a competition that unites some of the best skaters from around the globe apart from the European stars. 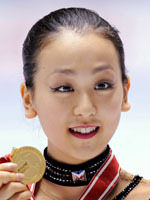 Champion in the final of the ISU Grand Prix in 2005 and 2009, Mao Asada has already racked up 12 Grand Prix medals to her name including the 2007 Bompard Trophy to follow her 2005 win, two NHK trophies (2006, 2008) and a triumph at Skate Canada in 2007. National champion in 2007, 2008 and 2009 she was also the first woman to perform a combination of three triple jumps (flip-loop, toe-loop). After learning her trade in Japan where she is now an idol and appears in a number of television programmes and advertising spots, often accompanied by her dog Aero, she took off to live in the United States in the summer of 2006 along with veteran coach Rafael Arutunian. At the beginning of the 2007-08 season, Mao returned to Japan to work with the great Russian skating guru Tatiana Tarasova at the University of Chukyo which they combined with training on numerous occasions at Moscow. Mao turned in an historic performance at the 2008 ISU Grand Prix finals at Goyang City when she became the first woman to perform two triple axels in the same programme and defeated Kim in the process in her home country. One of her chief rivals is the South Korean Kim Yu-Na who first took a tilt at Asada by claiming the title at the 2009 Four Continents at Vancouver where Asada finished third. Kim then turned the screw with a magical world championships performance, sweeping all before her to become the first ever woman to surpass the 200 points mark and dazzle her way to the gold while Asada fell and came fourth. A fantastic battle for gold is on the horizon at Vancouver 2010.